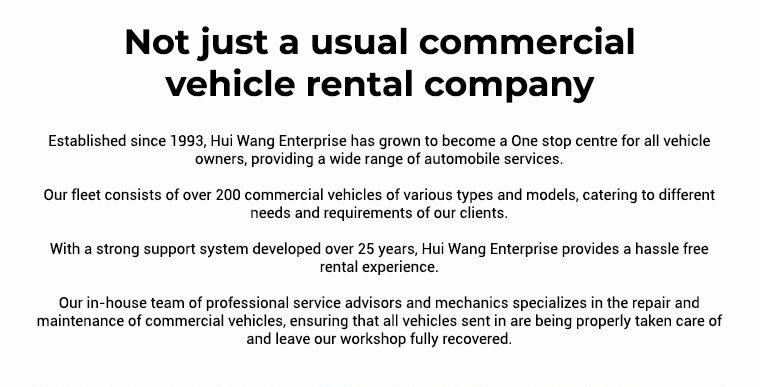 Established since 1993, Hui Wang Enterprise has grown from a small scale commercial vehicle rental company into what it is today; a One Stop Centre for all vehicle owners. With a fleet of 200 & more commercial vehicles of various types & models for rental, we are committed to provide one that can cater to you or your company needs. Besides providing 24 hours support, we also ensure that our fleet is regularly maintained, keeping them in tip-top problem-free condition. Excellent customer service, reasonable price for rental! Always there to answer ur queries. 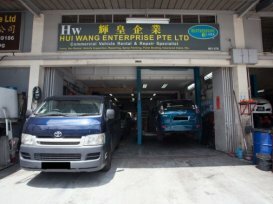 Hui Wang Enterprise is the place to go when come to rental of vehicle! Value for money, excellent support! Cheap and good servicing for passenger cars. Will not do unnecessary part changes.